What is the Box Turtle Connection? The Box Turtle Connection is a long-term study on Box Turtles (Terrapene carolina) in North Carolina. 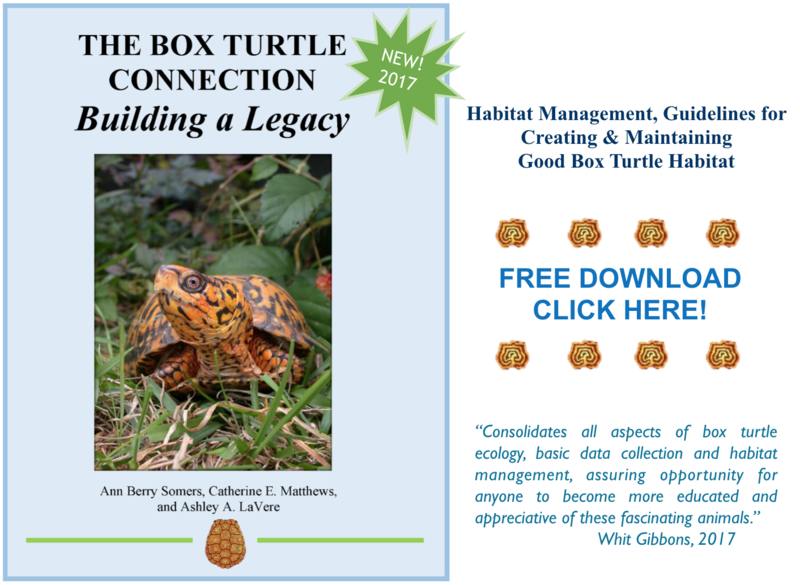 Our purpose is to learn more about the status and trends in Box Turtle populations, identify threats, and develop strategies for long term conservation of the species. Volunteer lay-scientists who make a long-term commitment to the project and are willing to be trained in data collection become Project Leaders. Each Project Leader (PL) manages data collection at a specific site, often these are places where they work like state parks but also include private properties. Turtles are permanently marked and measured by the PLs and data is entered into a password protected database managed by the NC Wildlife Resources Commission. The database is available to interested parties who submit requests to the Collaborative. See contact information on this website. How long is long-term? We are hoping the project will outlive the youngest person in the project so that 100 years from now our turtles and their offspring will be educating the next generations of scientists, lay-scientists, and other folks who care about the natural world. WHAT ARE THE OBJECTIVES OF THE BOX TURTLE CONNECTION? Don’t forget to ‘Like’ the Box Turtle Connection on Facebook to stay informed of activities and news!